Build the winning strategy for business and life for free with Roadmap Planner. 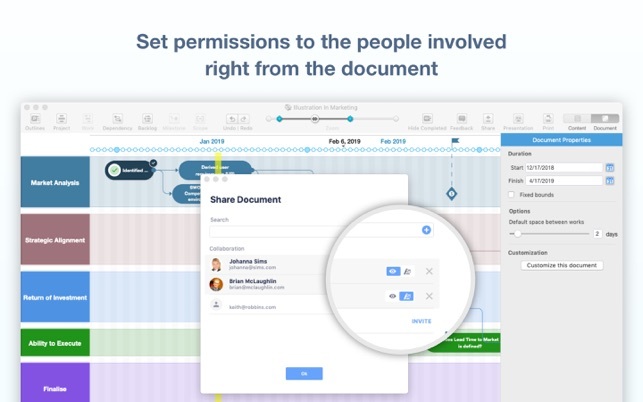 This is an ultimate offline/online solution for iOS and macOS that allows you to visualize the helicopter view of your projects in the timeline, keep track of parallel ongoing tasks, check milestone points, and share your ideas with your team. We offer an alternative high-tech way to increase the efficiency of doing business and drive the growth of profit with our comprehensive planning tool. This is a personal strategic organizer to develop and optimize a product vision. 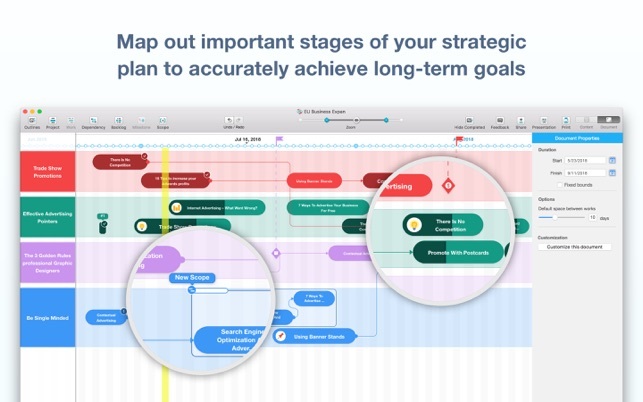 The app allows you to decompose strategic goals into steps, set milestones, and create dependencies. This will help your team schedule projects, avoid overlaps, and communicate with clients without using complex software. A simple way to map out and explore your ideas about system architecture, network design, solution delivery model, etc. Create and edit items in few clicks, freely drag & drop them across the timeline, and add dependencies between different tasks in different projects. 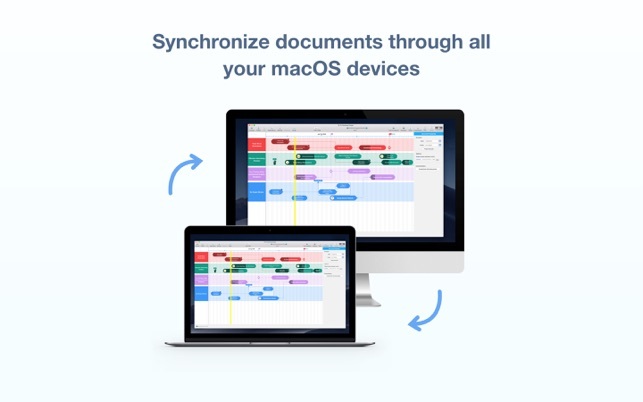 Access your roadmaps on the go with any of your devices, be it your laptop, tablet, or smartphone. The sync process is performed through our personal secure servers. Your sensitive information is totally safe and hidden from prying eyes. 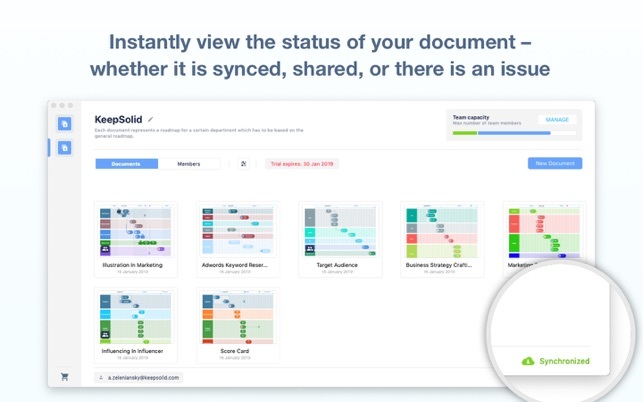 Instantly allow access to your roadmap for stakeholders to update and tune documents together. Being involved in a common process help team to complete tasks and smoothly achieve results. Showcase your vision of the company development to your colleagues. Connect your device to an external monitor or a projector so that everyone can clearly see the details. The app enables you to work both online and offline. This gives you an opportunity to proceed with managing projects even if you are on a desert island. Interactive system based on the Gantt chart allows drag items across the timeline. It is helpful to prioritize and schedule works, and organize your projects into easily manageable units which means a more refined control. If you have got an idea, but not sure where to add it, use the Backlog option. It allows you to create a list of works to drag them to project section whenever you are ready. - Subscriptions may be managed by the user and auto-renewal may be turned off by going to the user’s Account Settings after the purchase. The new update opens up broader possibilities for team management. Assign works to your team members, easily track the status, and always stay up to date on your team progress! - Advanced export to CSV for TeamGantt and Excel. 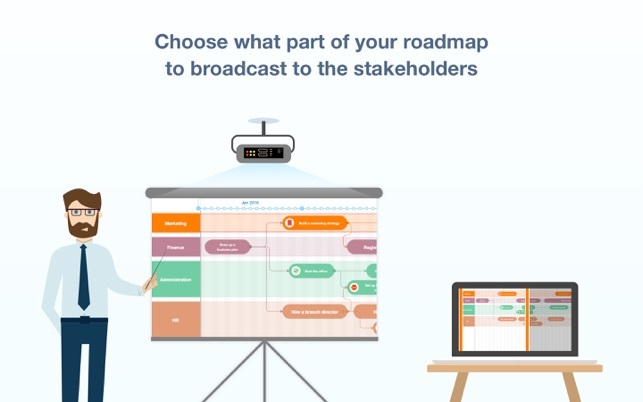 Update Roadmap Planner to enjoy the boosted performance and more efficient team work towards your shared strategic goals! Thanks for your detailed feedback, your comments are noted, we appreciate your positive review. Our team will keep working hard to improve the application, stay tuned for the next updates! We appreciate your positive review, thank you for choosing Roadmap Planner! We will keep improving the application in the future updates, stay tuned! We are pleased to hear that you are enjoying Roadmap Planner, thank you for taking the time to rate the application.